The XC-142 aircraft was the third aircraft evaluated in the Tri-Service Assault Transport Program. It used four cross-linked 3,080 shp General Electric T64-GE-1 engines, each driving a 15.5 ft four-bladed propeller. 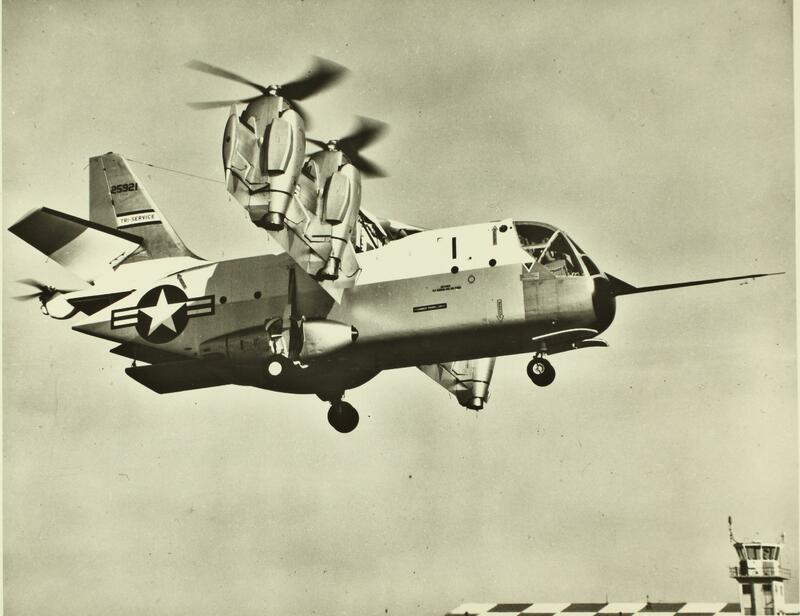 Roll was controlled by differential propeller pitch, and pitch by an 8 ft three-bladed variable pitch tail rotor. Yaw was provided by ailerons powered by propeller slipstream. 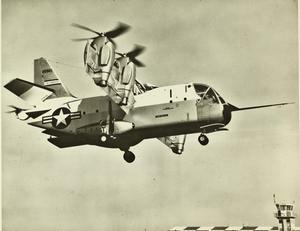 The wing could tilt through 100° allowing the XC-142 to hover in a tailwind. The tail rotor folded to the port side to reduce the stowage length and to protect against accidental damage during loading. This cargo aircraft was 58 ft long, had a wingspan of 67 ft and was capable of transporting 32 troops and gear or 8,000 lb of cargo. It had a rear loading ramp and had a maximum gross weight of 41,000 lb for a vertical take-off, or 45,000 lb for a short take-off. 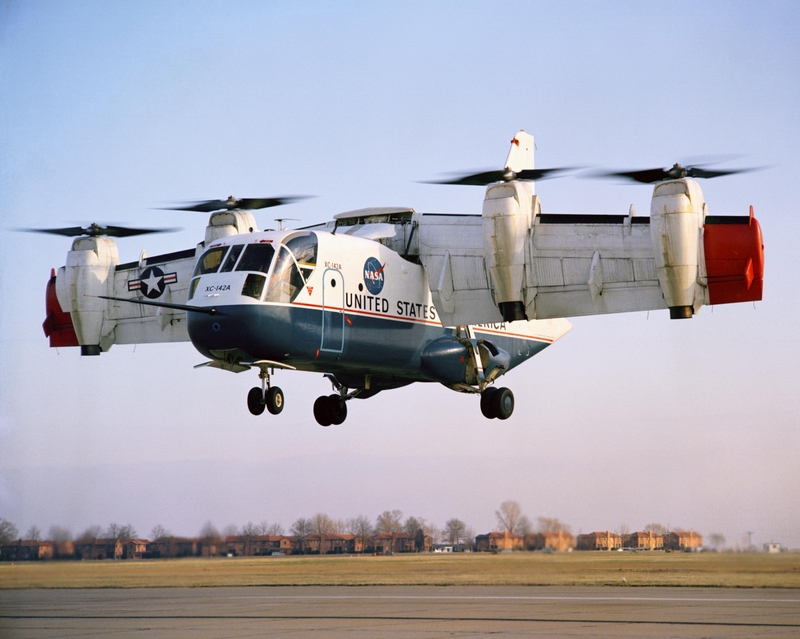 It made its first conventional flight on 29 September 1964, first hover on 29 December 1964, and first transition on 11 January 1965. Air Force trials included cargo flights, cargo and paratrooper drops, and desert, mountain, rescue, and carrier operations. Five aircraft were built, but mechanical failures (primarily the cross-shaft and gear boxes which could be damaged during wing flexing) and operator error caused four of them to be damaged in hard landings. One crash occurred as a result of a failure of the drive shaft to the tail rotor, causing three fatalities. 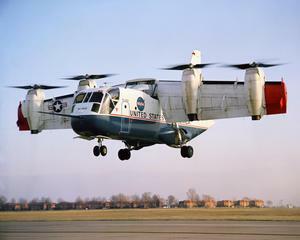 The XC-142 suffered from excessive vibration and noise, resulting in a high pilot workload. During the program, the XC-142 accrued 420 hours by 39 different pilots as an operational evaluation aircraft. Resources related to the XC-142A Tri-Service, provided by the Vertical Flight Society. Resources related to the XC-142A Tri-Service, provided by public sources across the internet.